Police on Tuesday foiled the march of National Conference and detained scores of its leaders after they tried to march towards Raj Bhavan against the recent killing spree in Kashmir. 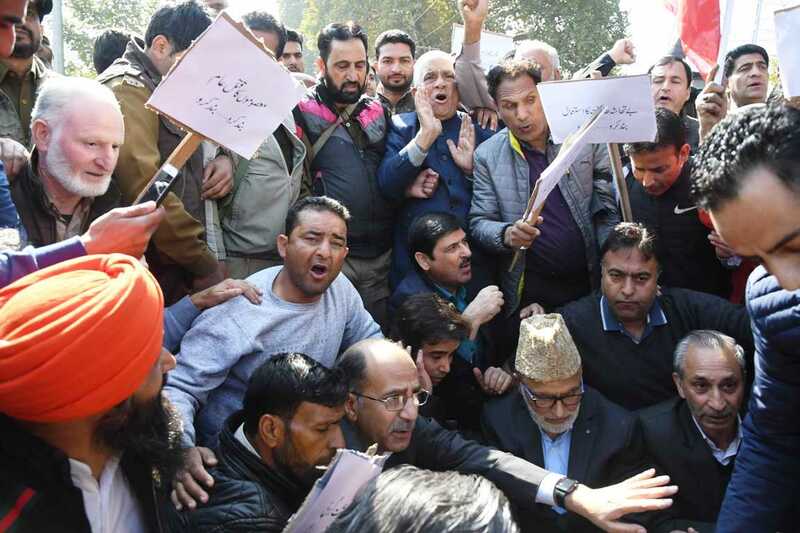 Raising anti-government slogans, the NC workers, led by party General Secretary and MLA Khanyar, Ali Muhammad Sagar, were holding placards and banners. The march started from party headquarters at Nawa-e-Subh complex and was heading towards Raj Bhawan. However, a large posse of police and paramilitary forces intercepted them near Radio Kashmir Srinagar. Sagar while talking to reporters condemned the civilian killings at Kulgam, saying that the Government of India must put an immediate end to the civilian killings hereby initiating a dialogue process to resolve the Kashmir issue. Addressing the rally additional general secretary Dr. Sheikh Mustafa Kamal said that the dispensation which is at the helm of affairs in New Delhi is inimical towards the special status of the state. “On one side New Delhi says that Jammu and Kashmir is the crown of India, but in the very same tone, they want to desecrate the bond that connects Jammu and Kashmir with the union of India. The people of Jammu and Kashmir will stand against any such machinations that aim to fiddle with our special status,” he said. District President Anantnag Altaf Kaloo made a fervent appeal to state and central government to initiate a process which is conciliatory. “This is a high time when policy makers in new Delhi have to take a call on Kashmir. Everyday people are dying and somewhere government of India has to start a process which will break this impasse and bring some respite to Kashmiris,” he said.